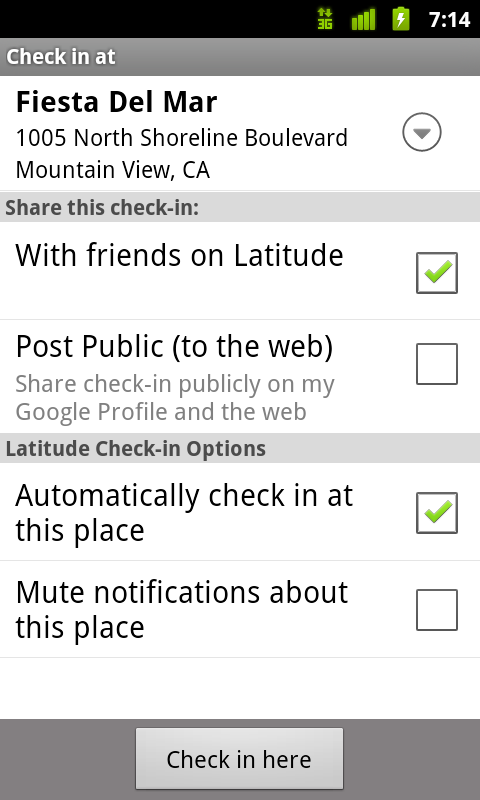 Update (2/11/2011): You can now see check-ins and your own check-in history at google.com/latitude from your computer. any plans to make it easy for us to create google places instantly using the mobile device? a lot of new destinations here do not make a listing themselves and thus, google places does not show them at all. Way to go! This is a feature I have been waiting for. Well played, well played! Do check-ins post to your Google Buzz feed? If not, why not? I love many Google products but the lack of integration between them is absolutely maddening. Aside from Buzz, why is this feature not integrated with Google Hotpot? Seems like a perfect fit to me. Check-ins use Google Buzz, but I have a Apps account with my personal domain, can I not use this? Keeps giving me errors when I try to check in. "Check-in failed, please try again later"
You're missing Facebook/Twitter crossposting to pull people into Latitude. Isolation makes it another Orkut. Dear Android Maps team -- can you please make it possible to disable your own Latitude icon on the map while signed in? It sits right over the GPS "current position" icon, so I already know where I am -- but it also obscures a lot of the neighborhood right around where I am: it just gets in the way. I never use Latitude because I'm sick of part of the map right around where I am being hidden. Still a fresh android phone owner, so sorry if it's a stupid question, but the market links on both this blog post and the 5.0 one return 404 (from my HTC Desire and from my computer). Is it due to geoip restrictions? (I live in Romania). I've been hoping for HTC to push an update for Google maps (since it came with the phone), but no luck. Not working in Russia either. I wish Google would stop unreasonable restrictions based on location, after all they already have no region-specific limitations. I might wanna ask (even though I already know the answer): will it be developed for Symbian? Just turn off the latitude layer. DONE! 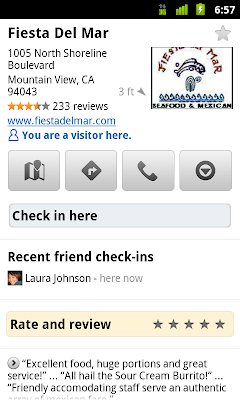 @Google: When you are not publicly sharing your checkins, it shares them privately, to a group of 0 people. Shouldn't this create a new group "CheckIns" in your contact list where you can assign certain people access to see your checkins? Would it be possible to choose to share my location with a selected group of my friends without having to send them a specific sharing request. I don't mind if they don't want to share where they are, I just want to share where I am without having to annoy people with emails and nagging them to start sharing themselves. 2.3.1 G1 in Bulgaria and no mention of check-ins. I'm disappointed, Google. -__- If there is a reason for it being US only, at least tell us. @Luke - You should just go to Menu and press 'Clear Map'. The icon would disappear. Can anyone tell me how can you checkout of a particular place? Or are they always automatic? Awesome.. Too good... But way to go.. It would be great if everything got integrated on the web side of things. Why is Google Maps on the web still not integrated with Latitude? Nice idea. Too bad it does not work for people that use Google Apps account. I do not need to see, where my friend are. I would need to know, how to get to my destination place. Navigation in Poland, please? My family and I use Google Apps. Buzz is not available to Goog Apps. Latitude Check-In uses Buzz (for some strange, unexplained reason). Hence, my family and I cannot use check-in ("Check-In failed. Try again later"). Very disappointing. I see that Buzz for Google Apps has been promised for a year but not yet delivered. Very disappointing situation. Google Calendar, will Google Latitude connect with it? Like check-in with an event that you have planned to attend? @keridel Your home is not a place. I really wish people would stop cluttering up these apps with their homes or whatever other BS amuses them (like "Rock over by the Parking Lot"). It's a service to check in to commercial businesses and possibly public places, like parks. Definitely should have the ability to add a check in location (in the case where it does not exist). Also like the idea of changing your own latitude icon so it doesn't cover the map. 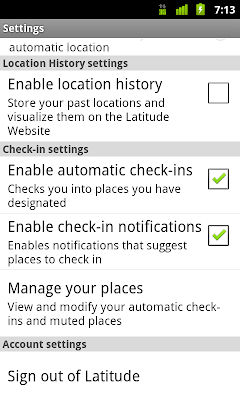 Also to enable latitude to work in Google Navigation. It seems sitting at home, I can check in absolutely anywhere in the world. I just need to search for that place and then in more options, there is the 'check in here' option. Seems like a bug? Otherwise, defeats the entire purpose of it? I do not see Check-ins availability in Google Maps 5.1 in Russia. Is it normal? There are places that are listed on Google Maps in my browser that are not available as places to check in on my mobile phone. Ironically, this seems to include most places that I would normally be wanting to check in at. They're additionally all places that are supported by Gowalla, Foursquare and Facebook. I hate to be "that guy" but this seems like another field Google has jumped into and squandered their opportunity to make a really good first impression with some polish and cool social aspects. I guess I'll hold out more hope for +1, Me, etc. what i fell is that there should be a chance for everyone to add places as it is not a easy task for google to chk all the places and list them in detail. u can verify and add a listing of that later. Upgrade your apps. There are over 60 services that now use the Google Apps account. Buzz *is* one of them. Integrate this service to cross post on Facebook and Twitter. I'm sure this could be better than Foursquare and Facebook Check-ins as there are more venues already. when is google latitude (and places) coming to webOS? Very nice features! 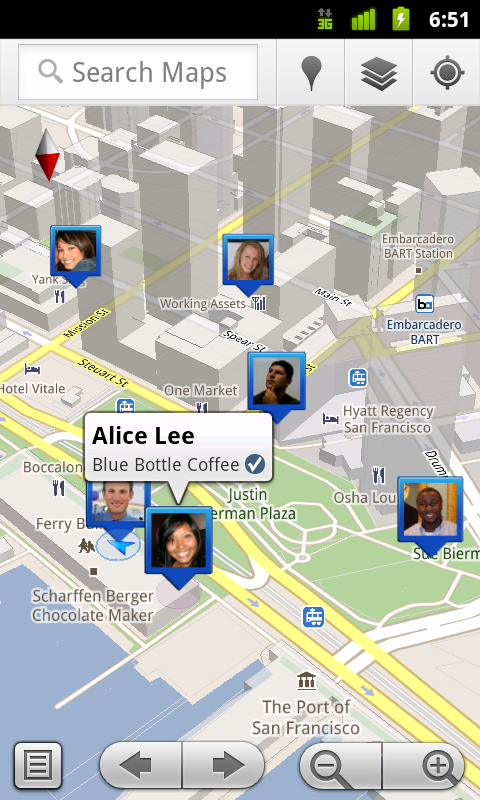 Actually exactly the features, that are missing in Foursquare and Gowalla. Unfortunately I've got an iPhone 4 so I cannot use all those great Android-features. My next phone is going to be an Android! No option to check in for users in Ireland. 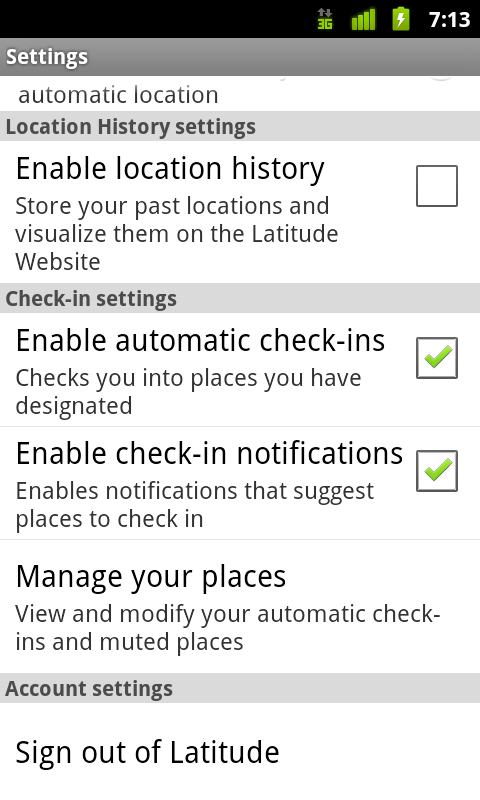 I am using latitude on my HTC desire in Ireland and do not seem to have an option to check in. When will navigation features available for Asia? We been waiting seen 1st android handset landed here and yet no reply. Combine this new feature with the NFC chip support in Honeycomb and Google have all the moniterisation potential they could ever want. Imagine this - you take your phone to your local coffee shop and your phone automatically checks you in. Next you pay for your coffee through your mobile phone. The owner of the coffee shop then provides you with a discount because you are a loyal customer. The more often that you check into the coffee shop the better the discount you get. Google are happy as you are purchasing things through their devices - presumably with an admin fee passed onto the retailer. Has it been rolled out to all Gmail accounts? 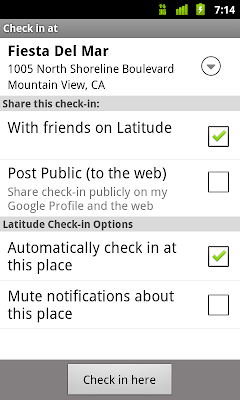 Now using Google Map 5.1 + Android 2.2 on Nexus One but can't find relevant options in latitude settings. 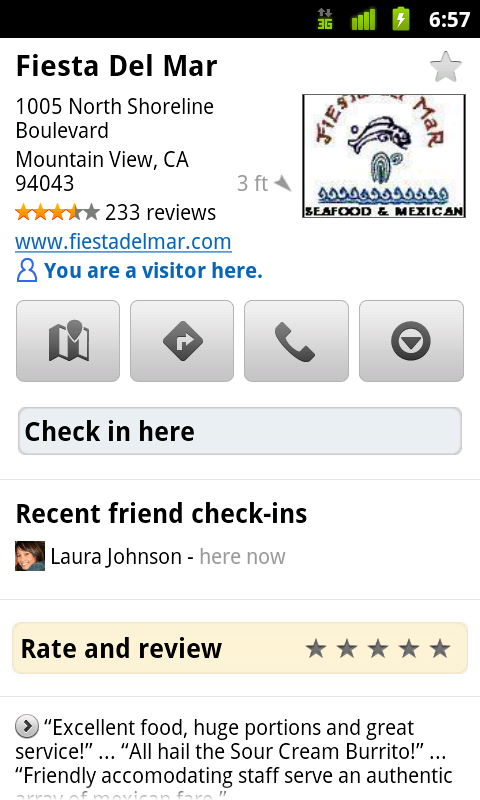 Automatic "Check out" apparently does NOT work as It says I am still at the restaurant while I am already at work. Please fix! So my problem is Latitude doesn't seem to be using the GPS function precisely enough (at least on my HTC Evo) to know that when I leave my local restaurant and go home (4 blocks away) that I've actually left - instead it kept checking me in via the "auto check-in" feature because I was in the proximity. Also can't search for places that don't show up on the "quick" latitude check in screen, instead you have to search the map, find the "place", then check-in from the Places page if it doesn't show up on that quick page. Cumbersome. Tried following the instructions on the help pages, but I don't have a "checkmark icon" under Latitude. Using a Google Nexus One in Luxembourg (Europe) with Android version 2.2.2 and latest Google Maps version 5.1.0. A workaround for the "shared to 0 people" bug is to set up a new group called "Latitude friends" to which you can add people that will get your checkin buzz. It worked (at least) for me. Awesome feature. But I want to be able to make custom locations to check in. Right now it only allows me to check into places that are all ready in your DB. So I can't check in at home, or a friends house. Add this feature and Latitude automatically become a VERY useful tool for tracking work hours, mileage and other such things. This is a super feature. I like the idea of this and NFC. i dont see this check in option under anywhere in maps app. it dont look like it got updated except for the 5.1 in settings/about. Standing outside a cafe that exists on Google places with my GPS on but it's still not finding it and there's no option to search, just a list of irrelevant business much further away. I guess Google don't know how important it is to be able to search for things??? I too use my own domain and get the failed, try again later error. bad oversight on developers part. my friend has a blackberry and my droid eris says "friend's device or version of maps not supported". is there a way to fix this or go back to an earlier version of google latitude to get real time updating? i have google maps version 5.1. I agree with Andrew Ratcliffe, as my family and I use Google Apps as well and are not able to use this great feature! When is Google expecting to let Google Apps maintainers to decide wheter their organisation can use Google Profiles, Buzz, HotPot and this checkin? If Google waits too long, my family has jumped the bandwagon and switches to Foursquare or the likes! Latitude is about 20% useful/accurate at best. Rarely updates correctly. Wife is on the road now, been in the same place for 1.5hrs. (no she isn't). I was spoiled with Verizon's Family Locator. Why can't I sign in anywhere with a Google Apps for Business account? I'm so tired of fighting this battle with Google Apps -- I pay more for a Google Apps account but I actually get less in terms of not being a fully fledged 'citizen' on all Google's services. Fix this once and for all -- and if you don't fix it everywhere, please fix it here!